See also 3x5px fleisch by artefucked. if you want to use this font for commercial matters. get in contact with me. the commercial use of this font is bind to a donation to any children health care in your country. I want to see the transfer voucher of the donation. Info: Created on 18th March 2013 . Last edited on 5th May 2013. 1. what is a font? 2. what is a matrix? @dpla can you give some further explaination for your questions? 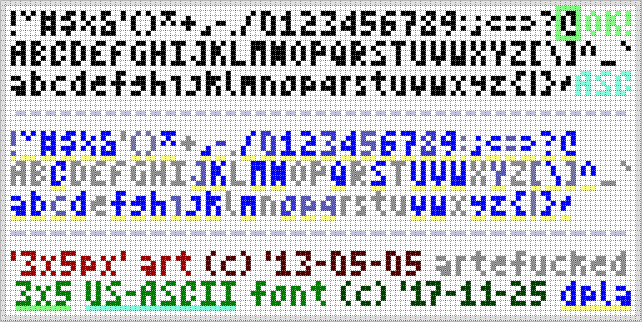 Oh, sorry: not later than yesterday, I began a new session of a great deal of related downloads (low-res pixel text charaters)… I saw your other ones by the way. What I just meant about your "3x5px", is: you cheated on both terms. More text if you want, later. So, this font is cool, with plenty of code points (a great effort), but it's still invalid to me, both in US-ASCII and in strict 3x5, which is deceptive (again and again). That's all I meant, after hours of reviewing similar works, my friend. 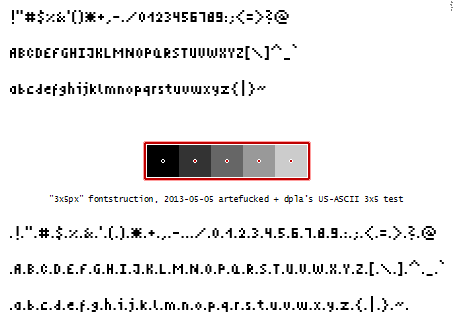 In practice, when I'll need to compare your font with the valid ones in US-ASCII (94 characters to begin with = an actual font (amongst other codes)), I'll discard or recolor in red all the glyphs that go beyond 3x5 (your base in the numerics and uppercase). Else there is no limit (no useful classification). When you described: “my goal was to create the smallest font possible”, well… it was at first, I suppose. Because the current matrix is huge, eventually (after your support of less necessary code points), all right. It took hours of fontstruction all the same! Good choice of 3x5 base pertaining to the diacritics, after all. Your wider design might be discarded for a more saving context, any plan for such a trial?